It's the New Year woo-hoo! I cannot believe we are finally in two thousand and fifteen! Can you believe it? For me the New Year means a blank page to begin anew. I like to set goals for myself with each New Year and I usually find myself accomplishing them as long as I don't make the list too long. Some of my goals include cooking with more vegetables, joining a gym (just did that! ), organizing my basement (yikes! ), making sure my immune system* remains supported by paying more attention to what goes into me, and spending more time with my children doing things they love. Hey I've already lost 75 pounds and for 2015 I'd love to lose 40 more, I so can do it if I put my mind to it! So let's talk about my New Year goals for immune support and more. I went to Walmart and browsed their health & beauty aisles to find a vitamin C supplement right smack dab in the middle of the vitamins shelves. Ester-C is currently on rollback at Walmart! I ended up buying two bottles of Ester-C 24 hour immune support*. One bottle was the 500 mg for myself and the other was the 1000 mg maximum strength for my husband. I also grabbed a daily pill container that has the days of the week in a cute color. I figured since I am so forgetful it might help to have a better way to keep track of my supplements that I take. I already take a daily hair, skin, and nail chewable and I know I've forgotten those a few times. I'm pretty sure this will help a lot. I will be placing all my daily supplements including my Ester-C 24 Hour Immune Support capsules into my little day of the week organizer. This will keep me on track and help me from missing my daily dose. I will keep my pill holder right by the coffee machine because I never miss a cup of Joe in the morning. 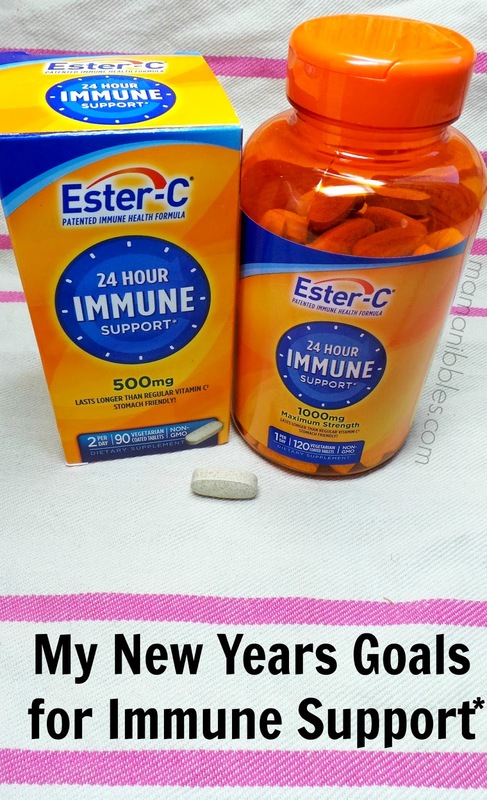 I read that Ester-C is C-Sorb enhanced so it works with my white blood cells for up to 24 hours and keeps working long after a regular vitamin C supplement. I have been comforted to find that Ester-C is non-acidic and very gentle on my stomach. I'll be eating a colorful lunch filled with fresh fruits, vegetables, lots of water and some protein on the side. After lunch a brisk walk or trip to the gym for at least 30 minutes minimum. If I cannot make it to the gym or outside to walk then I will try to do stretches and some exercise inside of the house. I am using a few drops of pure lavender oil with an unscented lotion that I've put into an old jar. If you try this be sure and check if you are sensitive to the oil before using and don't put more than 2% oil versus lotion mixed. I start by rubbing that lotion on a few pressure points every evening before bed. I love the relaxing effect. Pretty simple right? I think so! I like keeping things simple especially when it comes to supporting my health. If it gets too complicated I won't follow through and I know that. I'm sure many of you are just like me as well. I am so excited for 2015 and what it is going to bring my way. Many blessings in this new year to you all! I'll be following the Ester-C Facebook page and Ester-C Twitter account, I hope you will join me! Hi I'm Heidi. This is my life, my story & reviews as a busy christian Mom raising 2 boys, 1 teen princess girly girl, and 1 furry kitten named Pixi. Married since 2002 to my high school sweetheart and loving every minute of it. I like to do a little bit of everything but food is my passion! My heart is definitely in my kitchen and I love taking photos of my tasty creations. I just completely LOVE life!